These 4 new mobile homes (static caravan) are made for 4 to 6 persons. They consist of an equipped kitchen and 2 rooms : the first one with a double bed and the second one with 2 single beds. In the living room, the sofa converts into a bed for 2. There is also a bathroom and the toilets. Mobile home (static caravan) with 2 bedrooms, a bathroom, toilets, an equipped kitchen and a covered terrace to fully take advantage of the fresh air. It consists of a room with a double bed, another room with twin beds and, the sofa is also convertible into 2 sleeping places. 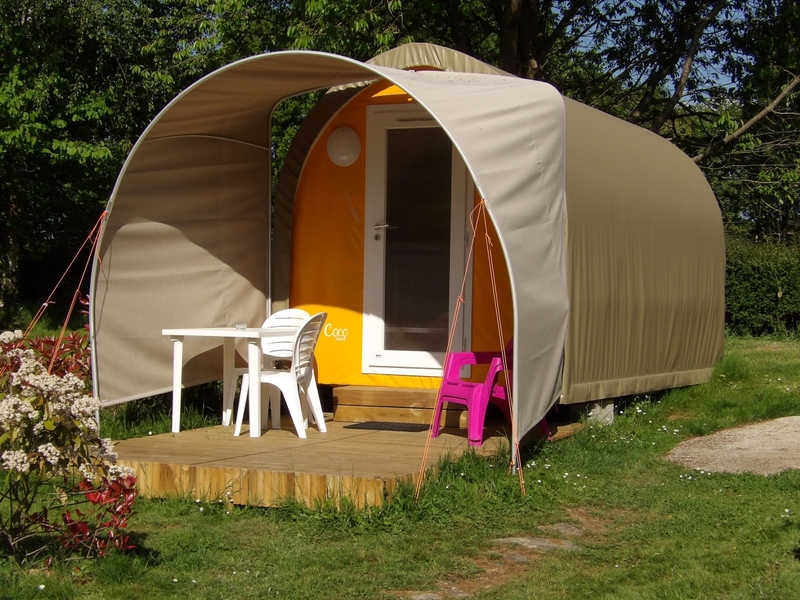 This mobile home (static caravan) was specially designed to accomodate 2 people. It has a room with a double bed, a bathroom (which contains shower, sink/washbasin, and toilets), a kitchen and a living room. If you have guests, that won't be a problem because the sofa is convertible into a double bed. The Adria caravan can accomodate up to 4 persons. It consists of a sleeping area (with a bed for 2), a kitchen corner (with a fridge, 3 gas hobs and the necessary dishware for 4 people) and a dining area (bench-seat/table which can be turned into a second sleeping place for 2). The caravan is not connected to water but you have access to the showers and the toilets of the camping. The caravan 2/3 places has a dining area which can be folded into a sleeping place for 2. On the other side, you have 2 small bench-seats and a small table that also folds to create a third sleeping area (chiefly for a child). There is also a kitchen corner with a fridge and 2 gas hobs. The caravan is not connected to water but, the camping sanitaries are just around the corner and at your disposal. Sleeping under the open sky with the beloved one in a comfortable bed is now possible thanks to the bubble room. This bubble of 4 m diameter will welcome you for a night (or more) under the stars. A stay for 2 with breakfast which can be enjoyed on the bubble's private terrace. Price of the night for 2 (breakfast included) : 85€ (per night during the week) - 95€ (per night during the weekend). Do not hesitate and come to have an unforgettable experience. In case of strong winds (> to 70 km/h) and for safety reasons, we will have to cancel the stay). 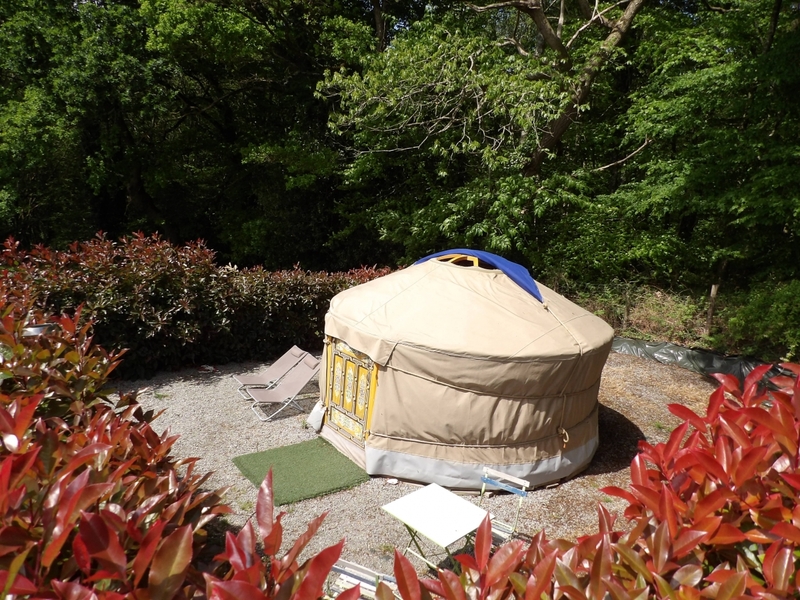 Our yurt can accomodate 2 people. It is set on a wooden floor. Inside, you will find a double bed, a small table and 2 floor cushions. The camping sanitaries are at your disposal. 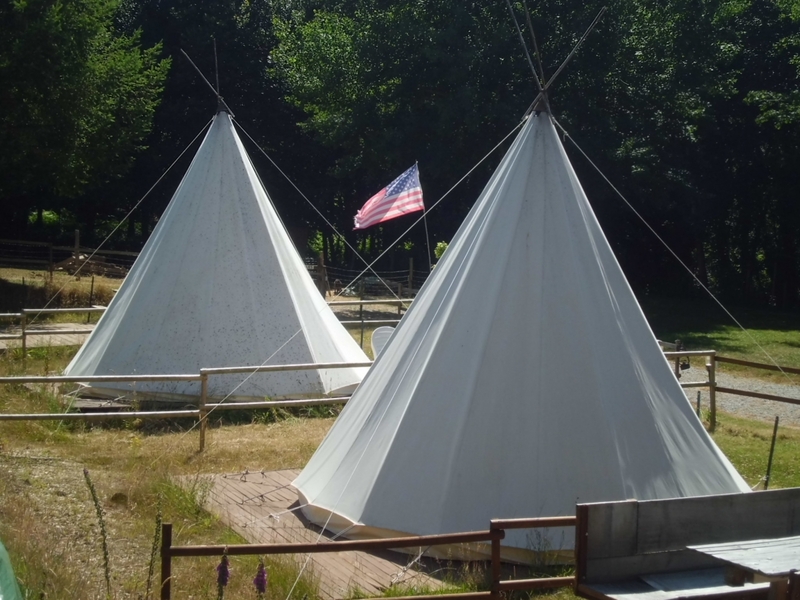 Our 2 tepees can accomodate up to 6 persons each. They are set on a wooden floor and are equipped with single or double air mattresses. It is recommended to provide hot sleeping bags and/or blankets, the nights are cool. You can rent the tepees daily or weekly. 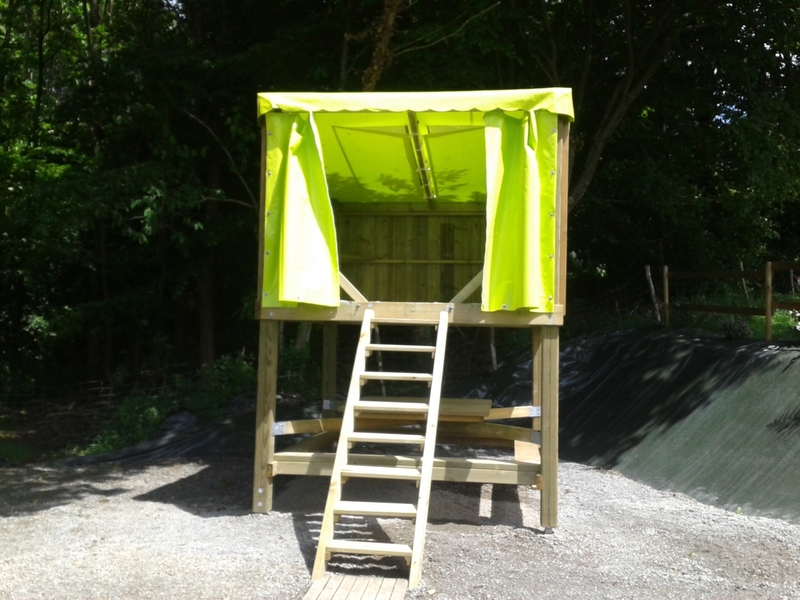 This wooden structure is perfect/ the ideal accomodation for our hiker friends who want to travel light. It combines a picnic table with benches around and over it, a sleeping canvas (like a trampoline) which can acomodate from 2 to 3 persons. We have equipped the campétoile with a futon mattress for a maximal comfort. You could also find blankets and pillows and a solar lamp too. The top canvas is transparent in order to admire the starry sky but, it can also be closed with another opaque canvas. It is recommended to provide good sleeping bags for the most skittish, the nights are cool. The cocosweet is an accomodation between the tent and the mobile home. It has a mobile home chassis but it is formed like a tent. Inside, you will therefore appreciate the comforts of a mobile home : a room with a double bed on one side and a living room with 2 convertible bench-seats on the other side (2 single sleeping places). In the middle, there is the kitchen corner with a fridge, vitro-ceramic hobs, a microwave and the necessary dishware for 4 people. There is also a small covered terrace with a garden salon. Following the success of the cocosweet, here is a new coco : the cocoduo. Even more comfortable and cosy than the cocosweet, in order to have a pleasant time with just another person ! By opening the door, you will find the small kitchen corner with a fridge, a vitro-ceramic hob, a microwave and, just behind a small shelf is the sleeping area (out of sight).